“Foxes of the Desert” Stadium is, pardon our language, a really cool name. And it’s a unique stadium too, partly due to the place where it was built. 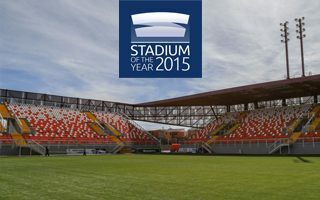 First let’s get one thing out of the way: it’s the smallest and cheapest stadium nominated this year. With just 12,346 seats, cost of under $9 million and issues during construction it might not seem impressive at first sight, but wait before you cast your vote in this year’s Stadium of the Year! Because Estadio Zorros del Desierto has a lot to speak for it, paradoxically. Sure, its barely covered concrete structure is very rough, but so is the city of Calama. After all, you don’t get the nickname “El Infierno” for nothing. It’s one of the hottest and driest places to play football in, located over 2,000 meters above sea level! In a place like this you almost need a stadium with a rough touch to it. Especially that in Calama the building was well thought through. Medium and cost-effective stands were a must, but what covers them is the added value of this stadium. Brown steel frame wrapped in brownish mesh creates a modern appearance, while paying tribute to the city’s copper industry. The “skin” spans above the side stands to create cover from sun. No opaque roof though, not needed in a place where it never rains. Simple, modern and raw, this stadium is entirely sufficient in terms of local football demand and seems to be very well tied with local identity. Copper aside (if possible when the home team is named after copper), the name Estadio Zorros del Desierto refers to rare kind of desert foxes seen locally.